The attitude you start your day with is the attitude that will guide your actions (and reactions) for the rest of your day. Sounds like a really cool quote from someone famous who would know a thing or two about such things, doesn't it? Well, if someone said it, I haven't read it yet. I have, however, recently become to believe it to be true. It wasn't the best start to a day. While I posted it with the tongue-in-cheek #not happening, it happened anyway. Frustration settled in and all the little things I would normally be able to let go of with a smile kept piling on. By the time my sister got in from training, I was ready to snap. And when I say snap, what I mean is burst into tears, because that is what I do when I get frustrated. I cry like a baby. But that's not the point. The point is that I let the word frustration and my initial feelings of it guide my actions and reactions for most of the rest of the day. I didn't get much done, and I was a mess. But how do I change that? Our bible study leader challenged us to start our days speaking those words - to write them on a sticky note or on our bathroom mirrors or wherever else we are going to see them and remember to read them. Remember to let those words guide our actions and reactions each day. Not words of hurt or anger or frustration. Those words don't guide us well, and they don't guide anyone else well, either. What kinds of things have you let guide your thinking in the past that have created bad outcomes? Have you found a way to turn your thinking around? Let me know in the comments! 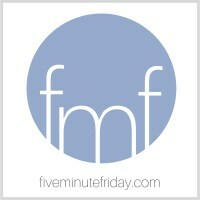 Wondering what Five Minute Friday is? Curious about how it works and what other people are writing? Click on the logo to your left. If that doesn't work out for you, visit http://www.fiveminutefriday.com for more information or to join the linkup fun. Cat, I love the way you developed this...and be sure,please, that crying over frustrations is not bad. I'm the opposite. I'm Asian, and people have a hard time telling whether I am happy, sad, or even alive. It does cause trouble, especially since I'm married to an Anglo (and yes, you all do look alike). My wife has no idea whether I am happy, sad, angry, or unconscious. And this, after fifteen years. BTW, I probably should not tell you this, but when I read the header for this blog, I read "Cat Politics". Blame it on the pancreatic cancer that's killing me, but I did get a smile out of my misapprehension. Thank you for stopping by, Andrew! I got a chuckle out of your misapprehension. I have my own vision problems - I was diagnosed with a condition several years ago that messes with the peripheral vision in one eye (and central vision as well sometimes) - and it causes me to misread things, too. On the subject of crying over frustration, I've reached a point where I can accept that (right or wrong) crying is my body's natural response to frustration, so I try to let the tears out when it happens. I think it drives my family crazy because they aren't sure of what to do with that response, even though I've reacted that way since I was a kid. They're used to yelling or pouring their frustration into some kind of action that get things done. Not crying. Thank you for this reminder at the start of the day. I think it's true that our attitude as we set out can have a big impact on how our day turns out. Choosing to focus on Psalm 118:24 this morning! Visiting from FMF #13. You're welcome. And thank you for stopping by, Lesley! How true! I like the idea your leader suggested, to wake up everyday reading this verse. So important that it changes the perspective.